Choose to be Happy: five boston things! ...because once upon a time a boy and girl traveled there to celebrate the brand new year with some of the very best of people. i was the girl. austin was the boy. and if i don't write down these five important-to-me things down, i could possibly forget them one of these days! and that would just make me sad. so sorry charlie. here you go. 1. when we got to our beach house my parents had it alll ready for us. even though they wouldnt be up for a day or two. but they made sure to make austin feel right at home! when we opened the fridge, they had an assortment of beers from all over the area sitting there waiting for him with a little note. it was just really cute and thoughtful. 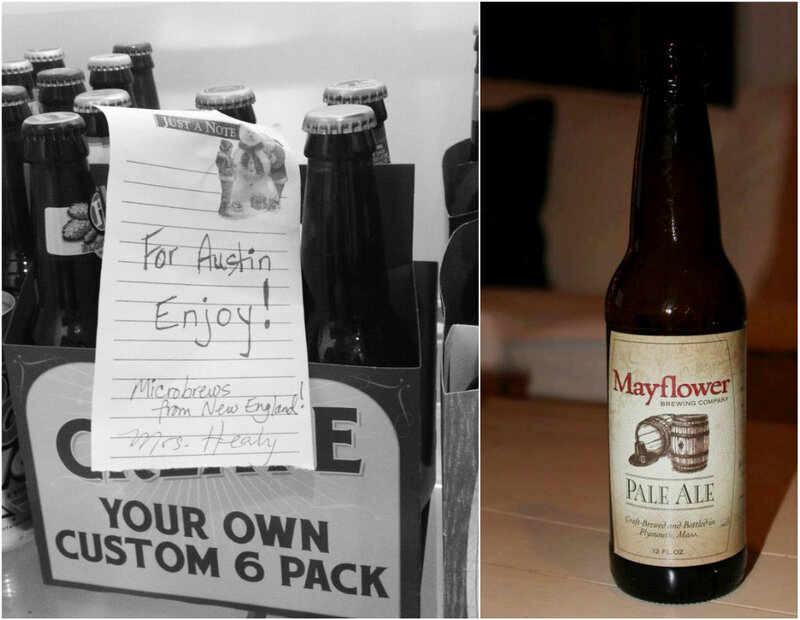 and while the note was from "Mrs. Healy", i think my dad might have helped with some selections as well. men and beer. they like it! 2. new years eve night for us was spent at two different house parties in Boston. house parties! we felt like we were in college again and it felt so good. one house with sister and her friends. which my heart almost couldn't take. because these girls, a lot of them have actually been friends with Brianna since she was a little bitty five year old in kindergarten. so to see them all grown up and so pretty and sweet. ahh! i loved it. and then once they went out to celebrate their first new years as 21 year olds, we headed to my brother's friends house which was just as fun for me to see familiar faces. and funny too because it was the house Colin used to live in during college. and then once he moved to Nashville. well he moved. his stuff really just stayed there, in that house, still hanging on the walls. 3. while in manomet we made sure to have the fullest New England eating experience. 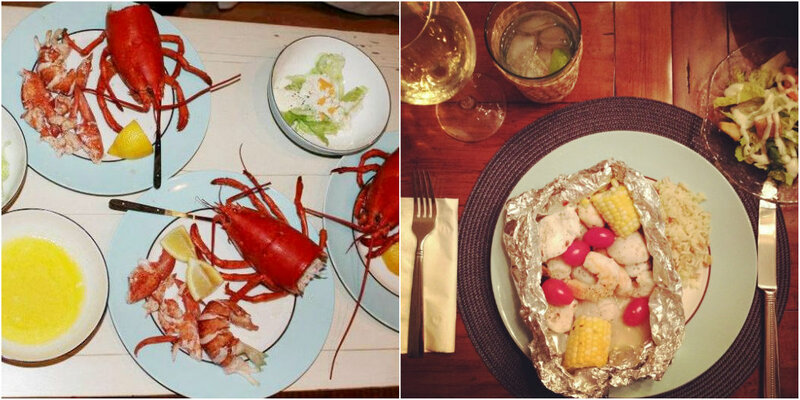 lobsters and clam chowder were one of course. and so there sat me, Chelsea Coleen from Connecticut, stone from Georgia, our friend kyle from Alabama and his girlfriend Lauren from Maryland. and the person that knew how to actually crack the lobster? Stone! so he did it for us all. what other talents do you have up your sleeve? the next night my parents made us one of their favorites - they call them "seafood packets"... shrimp, scallops, mussels, steamers, garlic, etc. we were happy people. 5. and lastly. 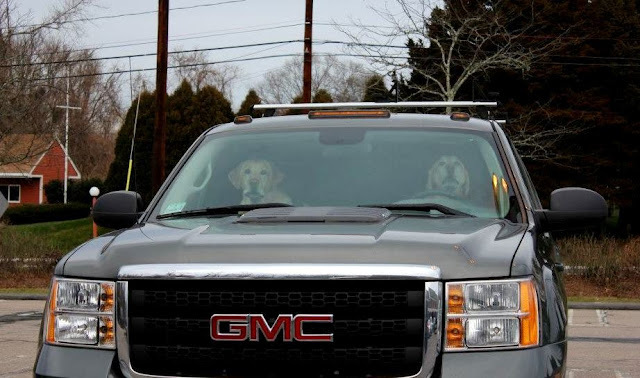 a picture, of two suspicious little drivers in the truck parked next to us. they were probably there waiting for their lady friends to bring them back a donut and coffee too.. followed by a drive by the beach and ride off into the sunset. they were pretty cute. how adorable your parents are!!! to have a welcome drank pack there when you guys arrived!! looks like a fun filled NY! Oh my gosh, that last picture kills me. It sounds like such an amazing getaway!